When Lindsey first proposed moving to Scotland for her masters degree, visiting the Isle of Skye and the Scottish Highlands were her main selling point to convince me to move with her. It totally worked. We spent hours sitting on our couch back in PA just googling all of the scenic vistas that appointed Scotland as one of the most beautiful places on Earth. Lindsey and I are here to tell you personally that Google images does not do it justice. That being said, this post will be strewn with images made by both Lindsey and myself on both digital and film in the hopes that you, the reader, will glean even just a fraction of the beauty of this place. Lindsey and I will be jumping back and forth throughout this post, giving our own perspectives so my portions will be denoted with a “B” and Lindsey’s with an “L”. A word of warning; this is going to be a long post. Introduction and disclaimer out of the way, so let’s get started: Day 1, The Scottish Highlands & The Journey to Skye. B - Early mornings in the city are still a bit jarring for me. We left our apartment early in the morning before sunrise because we had at least a five-hour bus ride ahead of us. Streets that are typically dense with students, businessmen and tourists are now all but abandoned. It’s a ghost town. That is until we get to our meeting point where there are about 50 other students who signed up for the same trip as us. After a few minutes, our two coaches arrive and we begin our journey just as the sun begins to rise. B - In the early morning haze, our tour guide clicks on the microphone and begins to point out all of the beautiful scenery just outside of our bus windows. This is good because I had previously been staring at the inside of my eyelids. Typically, I’d be “a bit grumpy” this early in the morning but all is forgiven considering the view. “We are officially in the Scottish Highlands,” Hojjat (pronounced ‘Hoji’), our tour guide announces followed by a round of applause from my fellow travelers. From that point on, I felt like I was in a dream or on some alien planet. Everything had suddenly become surreal. There were barren rolling mountains carpeted with moss, lichens and other such small plants that made them appear almost red from a distance while a thick blanket of fog hovered around their peaks. Some of these mountains cradled lakes (referred to as lochs) that were feed by runoff that formed waterfalls in varying degrees of intensity. The roads we drove on wound between the mountains and the lochs, preserving their natural form. The forests we trekked through were dense with tall green and yellow pine trees that were bare most of their lengths except for a tuft of foliage at their tops. The floors of these forests were thick with ferns and shrubbery with jagged rocks pricing through. It was absolutely sublime. Except of course for the group of students behind us who were some of the most obnoxious and disrespectful people I have ever had the misfortune to share a bus with. They spoke over our guide and laughed quite loudly at their own inside jokes. I wish I had enough money to waste it on a trip that I didn’t care about. Nevertheless and despite my thoughts of confronting them in a very “American” way, self-control got the better of me and I did my best to ignore them. L - Our first stop was Loch Lomond just north of Glasgow. It’s the point right where the highlands begin and the landscape is very evidently different. Luss, the little village on the south-western side of the Loch is quaint and charming, but I’m sure with the winds of winter coming off the water, it can be a little less charming. Back on the bus Hoji played some Highland tunes including the infamous 1960s song, “Donald, Where’s your troosers?”. It’s about a highlander lad who goes to London with his kilt and is teased by the local girls for wearing it, but he is proud nonetheless. B - Loch Lomond was breathtaking. I’ve seen large lakes before but never a lake like this. It was straight out of a fantasy world. It was surrounded by either cliffs, mountains or forests with little sailboats and tiny islands dotting its surface. It was again very rainy and foggy for the duration of our stay so we didn’t take too many pictures. They wouldn’t have captured the atmosphere of that place properly anyway. L - Next stop was about an hour north along the West Highland Way, a trail that runs from the north of Glasgow to Ben Nevis (151km +/- 94m). The mountains on either side were massive, steep, and piled in layers throughout the landscape. The shrubbery and greenery was almost patchwork in some places as the ferns turned almost a rust color and the tall grass turned pale yellow. Everywhere there are lochs: over 31,000. Loch Lomond is the largest in Scotland. B - The trail is something I’d like to at least travel a portion of myself. No technology, just a tent, a good pair of boots and perhaps a friend or two. I probably wouldn’t have the fortitude to stick with it for the whole 100 miles but I’m sure even a few days on the trail would spark some wonderful experiences. We’ll see what happens by springtime. L - Still along the West Highland Way we stopped at Glencoe to see the three sisters: Three mountains all in a row. The trick is to get them all in one picture, but it was very hard to do, so I took a panorama and Bo put three single shots into one image. It was misty and slightly cold, but very breathtaking. At one point a guy, randomly, handed me a Scottish Flag, and I got to take a picture with it waving in the air. B - This may have been my personal favorite location from the entire trip. It’s just a shame that we only had about half an hour at this spot. I could’ve spent all day there. We will definitely have to go back when we come out on our own. It’s crazy to think that something this spectacular is only about 2 - 3 hours from Edinburgh. You can see the three sisters in the image at the very top of this post. L - Back on the bus, as Hoji described more parts of Highland history, we passed Ben Nevis, the highest point in Scotland, (1345m - 4413 ft). If you hike the West Highland Way, you can climb the mountain and end up in Fort William - or you can just go around the mountain and get to Fort William, which is what we did. Fort William was another cute highland town, on the western side of Loch Eil which leads to Loch Linnhe. We stopped there for long break. Bo and I found a sandwich shop called “Deli Craft” and it was amazing. A tiny hole in the wall off the main pedestrian road. The cured venison was fantastic and Bo devoured a monstrous raspberry meringue. (http://delicraft.co.uk). We poked our head into a few shops along the road and into the tiny Highlands Museum. It was just an old renovated house with a smorgasbord of objects and displays. Soon enough though it was time to get back on the bus and move along. At this point I figured I would be exhausted, but I was still too excited to want to sleep. There was too much to see just out the window. B - Fort Williams was a quaint town in the middle of nowhere. I can relate to that sort of upbringing, though Hamburg PA wasn’t nearly as picturesque. One thing about Scotland in general is how you can find venison just about anywhere and anywhere you find it, it is absolutely AMAZING. The deer here are either red deer or roe deer, but they taste very similar to the whitetail deer that I grew up eating. L - It felt like a lot of driving but then all of a sudden the theme song to Game of Thrones began and in the distance, the magical Eilean Donan Castle appeared on the horizon. The nice thing about Gaelic is that a lot of the names use words mean particular things. Scottish name words: Loch is Lake, Ben is mountain, Kyle is a channel of water, Fetter is a field, Inver- is the beginning or mouth of water, and Eilean is an island. It was so spectacular to see. We didn’t have the time to actually go onto the castle (I would have), but we did get a lot of pictures of the outside, which is probably the cooler part anyway because the setting is so spectacular and parts of the inside have been re-done. It is where three lochs meet and mix so the ground was very swampy. If you think of a Scottish castle, you probably think of this one because it is featured in a bunch of films. It was sad to leave the castle, but we’d be back the next day to drive by it again. B - In Scotland, it seems as if you stare hard enough in any given direction, you will eventually see a castle, or at least the remnants of one. After a while they all start too look the same but the Eilean Donan Castle stands out. A long stone bridge leads to a relatively small but impressive castle on what must be the only solid ground in the area as it is surrounded by marsh or lake water. L - A short drive and we were in Kyle of Lochalsh/ Kyleakin and crossing the Skye bridge to get to the island. It’s the most direct way. There wasn’t much to see in Kyleakin. It’s a fishing village mostly, but gets most of its traffic from tourists on their way to Skye. We could have stopped off from Fort William and gone west to catch the ferry from Mallaig to Armadale and ended up on the southern most point of the island. Perhaps we’ll go that way next time? A short drum roll and we were in Skye! Instantly the landscape felt more desolate and harsh. It was a lot of rolling hills and empty space with random spikes of mountains in the landscape. Not at all like the cascading patchwork quilt of the highlands. B - Ah, Skye; the incentive for this entire trip. After crossing Skye bridge, it hadn’t really sunk in that we were actually there, but as a good tour guide should, Hoji spoke up and said, “Welcome to Skye! You’re actually here!” Thanks Hoji, you read my mind. I literally needed that reality check. Just as the Highlands seemed alien, Skye was even stranger but just as beautiful. There’s not much more I can say about it. It was unbelievable. L - Our first stop was outside Broadford to see the Cuillins - the black rock mountains are the highest point in Skye (3255 ft). From the river Sligachan the facade looks like a sleeping face. Can you see it? Legend has it that is the immortalized face of giant from the North. Even the river Sligachan has its own mythology. If you dip your face in the water for exactly 7 seconds you will have eternal beauty. We chickened out - so I guess we won't be blessed with eternal beauty. L -Our final stop was in the capital, Portree. On the eastern side of the island, the main view of the town is the harbour on Loch Portree and the Sound of Raasey. Our bright yellow hostel was right off the harbour and we had a wonderful seafood dinner with a view of the water. But we hardly did anything after because we were so exhausted. 9pm hit and I was out. The hostel was pretty nice. Our tour group had the whole place with maybe a few random people. It was brightly colored with a massive kitchen area and pockets of shared common spaces. We shared our room (two bunk beds) with an Indian couple on our trip, Zeen and Ibrahim (I think that would be how you spell their names). They were quiet people like us so it made for a nice evening. It was the first time Bo and I slept in a bunk bed together, but not together at the same time. Very strange. B - Portree is the largest town on the island in physical size and population. That being said, you can still walk from one side of town to the other in about 5 minutes. It is very much off the grid, which in my opinion was one of its best selling points. Then again, we were there just after peak tourist season so I’d imagine it would be absolutely crawling with tourists over the spring and summer months. Best not to visit then and we were told that if you do want to plan a summer getaway to Skye, book your accommodations at least a year in advance. Apparently more and more tourists visit Skye each year. In my opinion, this is a good and a bad thing. Sure, it stimulates the micro-economy of the island but then again, it would be an absolute tragedy if the island would become more commercialized, but perhaps that is a conversation for another time. Lindsey and I watched the sunset over the harbour that sits between two mountains. Fishing and sailboats bobbed and swayed in the breeze from their anchored positions. Portree is one of the most charming towns I have ever had the pleasure of being in. B - I had never stayed in a Hostel before. For those of you who may not know what that is, it is basically a place where you can rent a bed, usually in a shared room, for a night. They usually have bathroom and kitchen accommodations but that’s about it. It’s just what the traveler needs; a bed in a quiet town after a long day’s journey. I can say that it was a pretty good experience overall, though it was very odd sharing a bunk bed with my wife. 8/10. Would do again. End Day 1, The Scottish Highlands & The Journey to Skye. Day 2 to come. We found some great places for fantastic food here in Edinburgh. Whatever strikes your fancy: Spanish, Chinese, Japanese, Vegetarian, Southern or Comfort. This post reviews of some of the highlights around town. Day 2 of our Isle of Skye excursion. 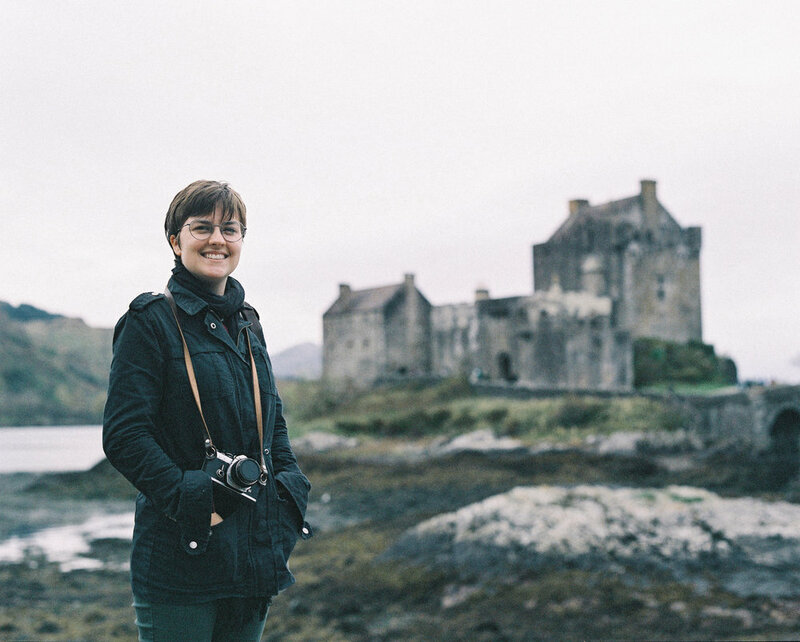 In this post, both Lindsey and I share our experiences from our quick tour of Skye. From waterfalls to shepherds to the best fish and chips on the planet; it's all inside! A Monday is only as boring as the city that you're in. In this post, Lindsey walks you through a typical Monday in the life of a grad student. In early October 2017, I got to hang out with my favorite photographer. It was awesome. Day 1 of our trip through the Scottish Highlands towards the Isle of Skye. Here's a bit about my experience of living in a city while being someone who never wanted to live in a city. What's an artist to do? First words from the Wandering Williams blog series.